MobileMuster is a proud sponsor of Planet Ark’s National Recycling Week. Planet Ark’s new research for National Recycling Week 2018 titled From Waste War to Recycling Reboot takes a look at some of the confusion surrounding recycling, weather the community trusts our systems and ways for you to reboot recycling. Some highlights from the report, featuring MobileMuster, reveal that awareness of long running product stewardship programs like MobileMuster has increased in the past 5 years, from 54% to 58%. Interestingly the over 35s are more likely to of heard about programs like MobileMuster. MobileMuster is committed to ensuring that all of the mobile phones and accessories we collect are recycled in an environmentally responsible manner to the highest standards. We provide information about our recycling process to show the community what happens to a mobile phone when it is dropped off at one of our 3500 collection points around the country. 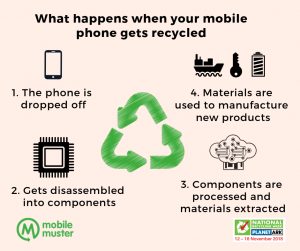 MobileMuster partners with groups, like Planet Ark, to maintain and grow trust in recycling so that Australians can feel confident their efforts are not wasted. It is important for everyone including households, business, schools, the waste industry and government to play a part. Take a look at the From Waste War to Recycling Reboot report and find out how you can reboot your recycling action.